From Farmer’s Markets, concerts, races, festivals, and other local attractions, to plenty of family-friendly events there are hundreds of options. The hardest part is choosing which ones to put on your calendar. Below are my picks for the top family-friendly activities for this summer. May you and your family have a memorable and spectacular Summer season, full of adventure, laughter, and exploration! It’s so popular that the Western Museum of Mining (which happens to have a premium vantage point) ,opens their grounds for families to come, set up a picnic, and relish the lovely grounds while enjoying perfect views of the planes. Sounds like a lovely day for a family picnic and a show! Whohoo!! Get your ADVENTURE on and kick off the summer with a party on the water. Whether you are a beginner or looking to be challenged and learn new skills, take a drive up to Buena Vista and plan a day – or the weekend! – at the river. 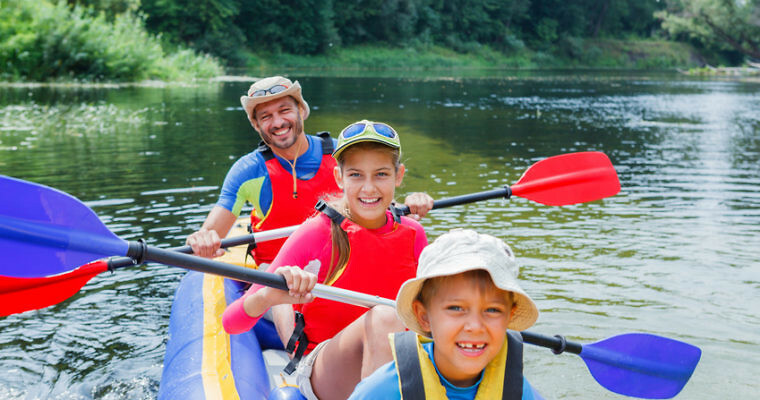 There’s Kid’s Paddle, Group Paddles, SUP Yoga, River Surfing, and even a Kayak Rodeo! All skill levels and ages are represented. Calm lakes for folks just starting out and the kiddos. Like something a little more fast-paced and challenging? Tackle the rapids if you have more experience or sign up for one of the many advanced clinics. Prefer to watch? Plenty of room to hang out at the “Beach”, listen to live music, enjoy the abundance of games and activities for kids, and shopping in the cutest town you’ve seen! Garden of the Gods was rated one of the best parks to visit in the nation! Luckily, the Garden of the Gods Visitor & Nature Center off of 30th street is home to all things GOG and offers guided tours, special talks, and weekly walks and runs for the whole family. The Visitor Center features an HD video on the history and formation of the Garden, as well as shops and hands-on exhibits. It is also the location of the Visitor Information desk. Here you can find a list of daily activities and special talks. It doesn’t get more Colorado than this. A tribute to the history and heritage of the Pikes Peak territory. Wipe away those tired eyes with fresh flapjacks, coffee, juice, and eggs. (Any little ones under the age of 5 eat free). The Pikes Peak Range Riders saddle up and ride out by 8 am so you’ll want to arrive early! Kids get to dress up, listen to fun cowboy music, watch the mesmerizing dancing of the Native Americans, and participate in the games. Rock Ledge Ranch is truly a hidden gem in our region. Literally step back to another era in meticulously cultivated grounds among a restored historic ranch. Enjoy the peace of the duck pond and the trickling creek that keeps the fields green and lush. Visit the old orchards, smell the cooking of fresh biscuits or apple sauce coming from one of the homesteads. Tour the homes to see how the early settlers lived. Beautiful homes, kept in their original state. See the ranch animals grazing. Imagine yourself living in a time when you had to cultivate and farm these lands under the watchful eye of Pikes Peak. [via Facebook:] The Rock Ledge Ranch Historic Site is an educational, non-profit living history farm and museum, which depicts life in the Pikes Peak region in four time periods: American Indian area in 1775; 1860’s Galloway Homestead; 1880’s Chambers Home and Ranch; 1907 Edwardian Country Estate.